When in New York I always try to stop by my favorite dessert spot on West 83rd–– not only for the gourmet flavor, but for the spectacular presentation. What their pastry chef can do with sugar is astounding–– delicately heated and spun and turned into a gorgeous, billowy piece of golden art that elevates everything it tops. And, spun sugar just happens to be the sweet inspiration behind the Italia Zucchero Ring. Like a talented pastry chef is sought after to create the best desserts, so too are jewelry artisans. And, the best of the best when it comes to precious metal artistry is in Italy. So, naturally that’s where I went to find the creators of this amazing ring. 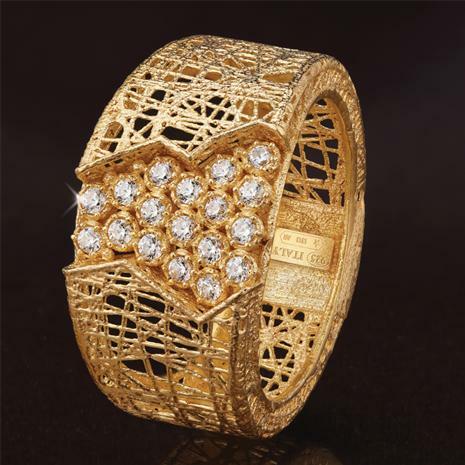 The Boldi Family has created striking jewelry for over a quarter of a century, marrying traditional Etruscan techniques with modern technology to achieve new milestones in Italian gold design. The Italia Zucchero Ring is the stunning result of such a fusion, with intricate, airy metalwork lightly sweetened with a sprinkling of scientifically-grown DiamondAura® stones. And, with a price of just $79, you can indulge her without the guilt.